Engine oil is critical to your engine’s ability to function in an efficient way. Our partners at Volvo Penta have recently put together an article talking about how to choose the right oil and how engine oil improves the durability of your engine. We agree this is a very important part of your equipment maintenance. Without lubrication, as we know, an engine will seize. Engine oil lubricates to reduces friction, but also cools the engine, stopping excess heat. Oil also removes waste and residues that are byproducts of the combustion process. As efficiencies with motor oils have improved, they have become a carefully balanced mixture of chemicals and lubricants. The base stock, which is the lubricant made from petroleum or synthetic oil, by itself is a process of refinement, creating a specified grade of purity and viscosity. Next, a viscosity modifier helps maintain the viscosity, or thickness, of the oil throughout different temperatures. This is critical because if an oil becomes too thin, as it tends to do at warmer temperatures, it will stop protecting engine components. Whereas, if it becomes too thick in colder temperatures, it won’t sufficiently lubricate and may cause problems from sluggishness to unresponsiveness. The final additives are chemicals that are sometimes called “the workforce” of the engine oil, as they protect the engine by extending the life of the engine oil, protecting the gears, and stopping the oil from forming sludge. How to Tell if Oil is the Wrong Type? Choosing the wrong type of oil can lead to negative consequences such as reduction of performance, and higher fuel consumption. In the worst cases, the wrong type of oil can lead to rubber-like materials forming that will block your engine completely, leading to engine failure. There are a few signs to look for that can indicate the wrong type of oil is being used. One immediate indicator is the iron levels within the oil, a sure sign of excessive wear in the engine. The iron levels are checked by sending an oil sample to a lab for analysis. Another way to tell is if fuel consumption is increasing over time. You might see signs of burning oil, such as changing colors on the exhaust emissions. The general cost of ownership and maintenance may also increase due to increased wear on the engine. The best way to ensure your engine operates efficiently is to follow manufacturer recommendations in choosing the viscosity, as well as the type of oil, if specified. Use a high-quality engine oil and change the oil regularly. 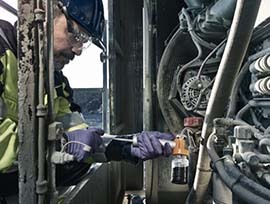 Oil analyses help you monitor the condition of the engine oil over time, allowing for preventative maintenance. Volvo Penta designs their own engine oils that benefit owners by keeping the total cost of ownership down and machinery working without breakdowns. They also take environmental responsibility very seriously, and are continually reformulating to lower or remove environmentally harmful ingredients, like sulfur. Volvo Penta has also implemented certain regulations affecting the chemical content of their engine oils to make sure they live up to industry best practices. Volvo Penta engine oils are designed to be top quality and extend the life of your engine. With decades in the marine industry, Pacific Power Group has a team of experts ready to help. To ensure you are using the correct oil for your Volvo Penta engine, or for any other marine industrial engine needs, contact our marine division.